John Gaulton Hubbard MBE – former footballer and sports official. Born: 16 December, 1930, Pretoria, South Africa. Died: 21 June, 2018, in Prestwick, aged 87. 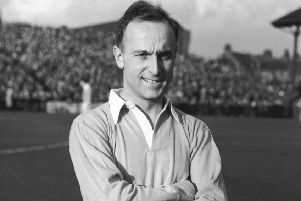 Johnny Hubbard, who has died after a short illness was, during his nearly ten-year Rangers career seen as the club’s best outside-left since the immortal Alan Morton, but he was better regarded as Scotland’s ‘Penalty King’. He took 63 penalties for Rangers, none were missed, but Airdrie’s Dave Walker, Kilmarnock’s Jimmy Brown and Falkirk’s Bert Slater became pub quiz legends as the only goalkeepers to save a Hubbard penalty. Those 60 successful spot-kicks accounted for almost half of the 129 goals he scored in 300 games for Rangers, a very good return for a winger. They also included his famous hat-trick in a 4-1 Old Firm win over Celtic in 1955 and, to this day, none of the legendary imports such as Brian Laudrup, Mark Hateley or Paul Gascoigne who followed him has matched that feat. “Hubby” was born in that rugby hot-bed, Pretoria on the high veldt in South Africa. His parents divorced when he was 12 and he was brought up by his mother and her African maid Martha. Always slight, he excelled in sports, was a prominent junior tennis player, enjoyed cricket, but, unlike the majority of the boys in Pretoria, he preferred the round ball to an oval one. He was in the Northern Transvaal provincial team at 16, playing for Municipals, the leading team in the area, where his form on the left wing soon attracted the attention of English clubs, for whom South Africa was a fertile recruiting ground at the time. He rejected approaches from Huddersfield Town, but when fellow South African Billy Arniston, already playing at Ibrox, suggested his name to manager Bill Struth, the great Rangers boss followed-up and offered the 18-year-old a deal: his air fare, a £100 signing-on fee and a three-month trial at £12 per week. Hubbard arrived in Scotland in 1949, quickly saw his original deal become permanent and never left. He took a little time to break into the Rangers’ team – coming off, as it was, the first Scottish “Treble” the previous season, but, by the time he married Glasgow girl Ella Black in 1951, he was the first-choice outside-left. National Service in the RAF interrupted his career, but, on his return he was soon back in the first team, and those comparisons with Morton began. His pin-point crosses were a source of goals for his life-long friend, Northern Irishman Billy Simpson: “We stuck together as the only foreigners in the side,” said Hubbard of their friendship. But Hubbard could score goals too when required. He could not play for Scotland, but he managed the next best thing, winning four “caps” for the Scottish League XI, against the Irish, English and Danish League XIs and the League of Ireland XI. He even scored against the Danes. He also won an unofficial South African cap, when a team of South African players with British clubs took on a Scotland XI, at Ibrox in 1956, in a special match to raise funds for the Great Britain team for that year’s Olympic Games in Melbourne. There were no Rangers players in the Scotland team, but the Ibrox faithful rolled up in numbers to support the green-shirted Springboks, who included Hubbard and his fellow Rangers star, Don “the Rhino” Kitchenbrand in their line-up, as well as future Scotland cap John Hewie. He set a new mark later in 1956, when he became the first African-born player to play in the European Cup, but, with Symon seeking to mould his own Rangers team, Hubbard and the other survivors from the Struth days were gradually being eased out. With the young Davie Wilson pushing for a place, Hubbard was allowed to depart early in 1959 for Bury. He left Rangers with three Scottish League Championship and one Scottish Cup winner’s medals. In his four years at Bury’s Gigg Lane, he played over 100 games before returning to Scotland, to play out his career with Ayr United. On retiring, he turned to coaching – while working as a Butlins Redcoat at the Ayr Camp. He then had a spell as a PE teacher, before finding the job which would define his post-football life, as a Sports Officer with the local council. His early love of tennis and cricket never left him. He brought the moribund Prestwick tennis courts back to life, and established an annual tournament which attracted a good class of player. He joined Prestwick Cricket Club, going on to captain them, and take a few wickets with his deceptive “donkey drops” as his slow off spin was disparagingly termed, by one former Minor Counties player with local rivals Ayr; who wasn’t so cheeky after Hubbard bowled him third ball. He could bat a bit too, being one of the stars, along with the likes of George Young, Bobby Evans and Bobby Collins of the “Footballers XI” who played summer charity games in the 1950s. A score card showing Hubbard scoring a match-winning 60 in one game for the Footballers, was put up on Facebook following his death. He encouraged all sorts of sports: gymnastics, badminton and golf, as well as his three favourites of tennis, cricket and, of course football. As a qualified SFA coach, he encouraged and coached the games at all levels, but his many years of running coaching courses and five-a-side tournaments, initially at the Dam Park Hall in Ayr, latterly at a local five-a-side complex saw him start many good players off on their careers. Hubby may have left Scot Symon, but, he was the epitome of “Once a Ranger, always a Ranger”, continuing to be a popular visitor and a real supporter at Ibrox until his final illness prevented him from attending. The club inducted him into the Rangers Hall of Fame in 2008, to popular acclaim. He also, with the assistance of Rangers’ Club Historian David Mason, penned a well-received autobiography, entitled, naturally “The Penalty King”. Hubbard, a pawky character with a wealth of stories and time for everyone – it would take him an age to walk down Prestwick Main Street, or Ayr High Street as so many wanted to stop and speak to him, is survived by Ella, his wife of 66-years – he died just five days before their 67th wedding anniversary, daughter Linda and sons Raymond, like his father a PE teacher and well-known marathon runner, and John. His vast contribution to sporting life in Ayr and Prestwick was acknowledged by the award of the MBE, an honour which he greatly prized and of which this son of Africa who became an adopted Scot was justly proud.